Under the big top, socialite detective Phryne Fisher (The Green Hill Murder, 2007, etc.) falls for a clown, learns to love a bear and solves a case of sabotage. When her former lover, half-gypsy carnival worker Alan Lee, asks for help in discovering who’s sabotaging Farrell’s Circus, Phryne is up for the challenge. Because a horse has been poisoned and a rider injured, Phryne is able to apply for a job as a trick rider. Meanwhile, a hermaphrodite who worked at the circus is found murdered in a Melbourne rooming house. Miss Parkes, a killer just released from prison, is arrested, but Constable Harris thinks she’s innocent, and DI Robinson agrees. Robinson, realizing that a murder involving rival gangs is somehow connected with the circus, becomes concerned for Phryne, for whom the circus is a whole new world. At length she learns to do the equestrian tricks well enough to be in the show. Meantime, she makes both new friends and new enemies in the rigid circus society. Her affair with one of the clowns raises eyebrows. But disapproval is the least of her worries as she tries to discover the identity of the saboteur. When her case collides with the police investigation, the consequences are perilous. 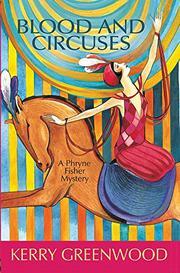 Circus oddities and exciting men produce a thrilling series of challenges for Phryne. Above-average for the series.